I heard album Dec 1st and the tour starts in April. Same here, with a single around September. Have seen a lot of "1st single out Sept 8th followed by album (SOE) release on 1st Dec" posts across social media today - sounds good to me!??? Dave Fanning speaking to The Irish Sun HERE. Some great music being released so far in 2017 and a U2 record would add to the fun. 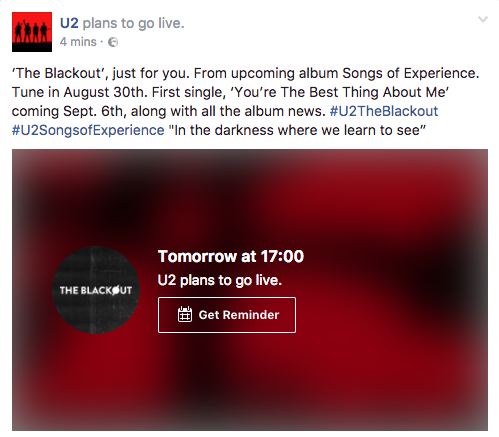 U2 bringing out a new album. Another U2 CD for my collection. I hope U2 come to AUSTRALIA IN ADALAIDE S.A.? They better, it has been far too long since you came U2. You must see us AUSTRALIANS TO U2, it isn't fair we always miss out on seeing the world's best band U2. We love you in AUSTRALIA to U2, so please come to AUSTRALIA, ADALAIDE S.A. I really hope that they start the tour in Australia/New Zealand. Our brothers & sisters down there have been neglected for too long. This just showed up on my Facebook feed. Tomorrow it all begins! AHHHH!!!! They literally did that like right after my last post lol, thanks for proving me wrong boys!!! SO WHEN do we have to tune in t......??? 5pm UK/Ireland time, presumably different times of day for everyone else in the world. How crazy is this !!!!!!! Noon time in NYC! That clip sounds amazing! I can't wait! Maybe they're going to do an SOI and just release it on the day without any prior announcement (but without the airdropping into everyone's iTunes accounts).